It is a society that is, officially, a paradise. Superior to the decadent West, Stalin's Soviet Union is a haven for its citizens, providing for all of their needs: education, health care, security. In exchange, all that is required is their hard work, and their loyalty and faith to the SovietState. Leo Demidov knows this better than most. A rising, prominent oficer in the State Security force, Leo is a former war hero whose only ambition is to serve his country. To defend this workers' paradise--and to guarantee a secure life for his parents, and for his wife, Raisa--Leo has spent his career guarding against threats to the State. Ideological crimes--crimes of thought, crimes of disloyalty, crimes against the revolution--are forcefully suppressed, without question. "Child 44 not only is one of the best mysteries of this year, but it is one of the most remarkable and original debuts in recent years. 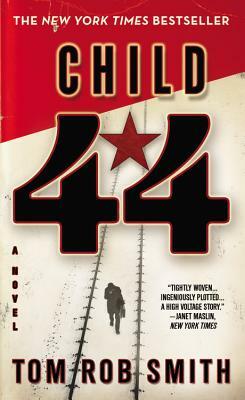 Set in post WWII Stalinist Russia, Child 44 works equally well as a hard-boiled novel, a political thriller, a regional mystery and an emotional, even romantic story about a couple rediscovering each other. It is at once gritty, chilling, depressing, hopeful and, above all, fascinating...Dennis Boutsikaris is the perfect reader for this story. Boutsikaris, who frequently shows up on Law & Order, captures the story's angst, nuances and accents."